Notes: Ex-MP "City of Camanche"
Description: After setting one of the SD-40-2's, BRHU heads West around the curve at Davis Junction, IL. Description: Westbound in great afternoon light, IC&E 6427 leads a real grab bag of power, most of it is DM&E. 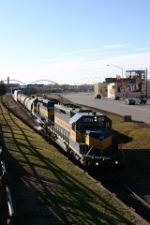 This train, heading to Huron, South Dakota left the Belt Railway of Chicago several hours earlier. Description: Two ICE SD40-2's and a GP40-s (also ICE, former SP) drag a long consisit of mixed freight out of town. Description: This DME freight was switching when we left Wall Drug, so I popped over and grabbed a shot. Description: UPY 940 Trenton local on the UP Trenton Sub. Title: ICE 6427 Get them while you can cause this railroad had just got bought out! Description: The conductor waits to reboard this ICE detour after I drove him up from the rear of the train. The train got hit by the detector a few miles back, 7 cars from the rear of a 120 car train makes for a long walk. So, I was in position for a photo (see CP 9611 - #614) The train stopped in Bangor, so I drove down to offer any assistance. The conductor found sticking brakes on the 7th from the rear car, he cut out the car's air and I gave him a ride to the head end. I didn't get the photo I wanted, but to help out a crew, it was worth it! Description: One of the last ICE eastbound detours departs Rockland for Chicago. Description: This was a unit Corn Syrup train to KC. Description: IC&E switching Liberty in the snow. Description: CP train #486 rolls into La Crosse for some yard work. Title: CP Train 486, Tomah Sub. Description: With Three Sd40-2s the Engineer has a Good roll on this Chicago Bound Train. Description: After Picking up at LaCrosse 486 has 75-Cars, Bound for Chicago.